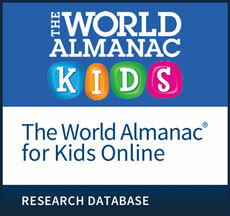 Erasing the line between homework support and fun exploration, The World Almanac® for Kids includes exclusive online-only material as well as content from award-winning Chelsea House and Facts On File sets and series. Each subject area provides resources for homework, reports, and projects, and kids can explore age-appropriate topics while developing online research skills with a trusted content source. The Teacher Support drop-down menu at the top of the home page provides easy access to a treasure trove of content that will help educators get the most out of using the database in class, including comprehensive lesson plans—specially created by our editors—for selected modules, including Ancient Civilizations, Animals, Our Planet Earth, Our Solar System, Countries of the World, The 50 States, Canadian Provinces, and U.S. Presidents. Teachers will also find science diagrams, maps, and graphic organizers that help with any lesson in the Teacher Support drop-down menu. The top bar also features a link to accessible Homework Help articles for students, and the Resources drop-down menu puts videos, interactives, science projects, Fun Facts articles, maps, flags, and an interactive Trivia Challenge game right at your fingertips. In addition, users can find a wide range of interactives on selected topics, including more than 20 multiple-choice “Test Your Knowledge” quizzes, a fun way for students to practice what they’ve learned in core areas such as American History, U.S. Government, Biomes, Our Planet Earth, Human Body, Plants, and Ancient Civilizations. Students can take these quizzes again and again to reinforce the subject matter and identify any areas that need more practice. Also, to reinforce the content and vocabulary taught in class, students can use the more than 40 interactive worksheets that were specially created to support the STEM content in this database. Topics include Animals, Human Body, Our Planet Earth, Plants, and Our Solar System. Students can use the drag-and-drop functionality to label diagrams, match words, and fill in the blanks. World History: Overviews of specific time periods backed up by detailed articles, as well as maps and photographs, Fun Facts articles, videos, interactive quizzes, and links to bullet biographies, giving a well-rounded view of the country’s key moments and figures. Ancient Civilizations: Articles, images, maps, links to bullet biographies, interactive quizzes, and Fun Facts articles providing accessible introductions to Ancient Mesopotamia, Ancient Egypt, Ancient Greece, and other ancient cultures, including the history, major leaders, lifestyle, religion, and legacy of each civilization. Animal Behavior: Articles on different aspects of animal behavior, including animal communication, courtship, defenses, hunting and feeding, life in groups, and migration, plus Fun Facts articles, interactive word puzzles, and links to bullet biographies. Animals: Articles, interactives, and videos on more than 100 mammals, birds, aquatic species, insects, arachnids, reptiles, and amphibians. Includes information on anatomy, physiology, feeding, hunting, endangered species status, and family tree charts, with a variety of Fun Facts articles about these interesting creatures. Biomes: Fascinating articles covering geography, geology, flora and fauna, and the future of six different types of biomes found on Earth—deserts, freshwater biomes, marine biomes, forests, grasslands, and tundra—with Fun Facts articles, videos, interactives, and links to bullet biographies. Canadian Provinces: Details on the history, culture, geography, and economy of each province or territory. Also includes places of interest, famous people, Fun Facts articles, elevation and outline maps, flags, and coats of arms. Career Ideas: More than 175 careers and jobs in 12 key categories. Includes career overviews, resources to explore potential careers, and profiles of real-life professionals, plus video features and Fun Facts articles. Character Matters: Timely, straightforward articles and videos on being fair and honest, dealing with bullying, handling peer pressure, teamwork and respect, managing responsibilities, dealing with frustration and anger, and managing conflict resolution. Includes Fun Facts articles and interactive word puzzles. Countries of the World: More than 190 nations with details on population, industries, major cities, geography, and national history—plus video features, Fun Facts articles, maps, flags, and images. Energy Today: Informative articles covering different types of energy, the science behind them, and their environmental impact. Includes information on biofuels, solar power, nuclear power, wind power, water power, coal, oil and natural gas, geothermal energy, and hydrogen fuel. Plus, Fun Facts articles, videos, and interactive word puzzles. Exploring Space: Fascinating articles that take students on a virtual journey to outer space, documenting the history of major space exploration, including the Mercury Program, the Gemini Program, and the famous Apollo Program. It provides facts and figures about the International Space Station, NASA’s search for life in space, and other human spaceflight feats. This module also covers topics like the formation of the universe, stars in space and galaxies beyond ours, and the Big Bang theory as well as black holes. Fun Facts articles, videos, interactives, and an extended Key People section round out this up-to-date module. Famous People: A high-interest section divided into nine professional categories, highlighting major personalities from history, pop culture, current events, and more. Includes more than 700 book-length biographies, each the equivalent of 100+ pages—perfect for book report writers. Also features engaging videos and Fun Facts articles, including this year’s Kids’ Choice Award Winners. Healthy Eating: Informative videos and important facts about how and what we should eat, including basic nutrition, weight management, nutrition for sports and exercise, eating disorders, and food safety and disease prevention, plus interactive word puzzles and food-related Fun Facts articles. Holidays and Celebrations: Detailed information on the backgrounds, customs, and traditions of the world’s holidays and celebrations, from religious observances to independence days, organized by region. Includes holiday-related Fun Facts articles and glossaries. The Human Body: Clearly labeled diagrams, photographs, and accessible text providing an essential introduction to the human body. Includes information about the body systems and the five senses, plus Fun Facts articles, videos, interactives, and links to bullet biographies of famous people in medicine. Math Corner: Informative articles, student worksheets, videos, Fun Facts, and interactive games designed to help students practice the core math skills taught in the middle school curriculum. Our Planet Earth: Fascinating articles explaining how the Earth formed, rocks and minerals, fossils, erosion and weathering, earthquakes, volcanoes, and much more. Detailed illustrations, photographs, Fun Facts articles, videos, interactives, and links to bullet biographies help explain the science. Our Solar System: In-depth content on the sun and all the planets in our solar system, including Mercury, Venus, Earth, Mars, Jupiter, Saturn, Uranus, Neptune, and the dwarf planets including Pluto. Additional coverage includes phenomena like asteroids, meteors, and comets. With interactives, Fun Facts articles, videos, and an extended Key People section, this module is perfect for studying our own solar system and the planets around us. Plants: Easy-to-understand information, along with colorful images, on all things botanical in this section. Features interactives, Fun Facts articles on all manner of plants, and links to bullet biographies of famous researchers in botany. Primary U.S. Sources: A collection of founding documents, historic letters and proclamations, famous speeches, Supreme Court cases, and songs and sayings that have shaped American history, with related Fun Facts articles, videos, and links to bullet biographies—a great resource for the middle school researcher or any student that is required to use primary source documents in support of their studies. Sports: Baseball, basketball, football, hockey, soccer, and the summer and winter Olympics—find historical stats, sports trivia, Fun Facts articles, images, and videos, as well as highlights from the 2016 Olympics in Rio, including gold medalists in all categories, with links to current and up-to-date biographies of major winners. Understanding Art: An overview of art—from painting and sculpture to architecture, installation, and performance art—covering what art is, major art movements from prehistoric art to Pop Art, and the ways art intersects with social and cultural influences. Hundreds of full-color images of famous pieces of art; videos on art, art history, and painting and drawing techniques; and links to many biographies of famous artists enhance the accessible articles. A timeline, glossaries, and Fun Facts articles round out this unique unit. U.S. Government: Informative articles, images, videos, interactive quizzes, links to bullet biographies, and Fun Facts articles about the three branches of government, the Constitution, political parties, and citizenship and civic responsibilities. Weather & Climate: In-depth articles covering atmosphere, weather, moisture, clouds and rain, climate, and climate change, plus important information on how weather forms, the difference between weather and climate, and major weather events such as thunderstorms, tornadoes, and hurricanes. Fun Facts articles, videos, interactives, and links to bullet biographies help students understand these important topics. World History: Overviews of specific time periods linking to descriptions of milestone events in world history. Includes Fun Facts articles and videos. Writer’s Corner: Clear, concise entries, many with images and diagrams, explaining the often confusing rules of grammar, punctuation, and writing. Fun Facts articles offer interesting tidbits of information about the English language.